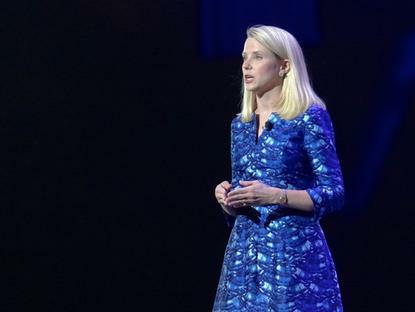 Yahoo CEO Marissa Mayer, speaking at the Consumer Electronics Show in Las Vegas in January 2014. Yahoo has reached a deal to acquire Polyvore, an e-commerce site that lets you shop for "what's trending in the style community," Yahoo announced Friday. It hopes the deal will give it a place to sell more ads for retailers. The site lets users shop for clothing and accessories, but it also has a social networking component that lets users post collections of desired items, like they might on Pinterest. The majority of Polyvore's users are women between the ages of 18 and 34, the company says. In its announcement, Yahoo cited advertising as a key driver of the deal. Yahoo will integrate Polyvore's ads into Gemini, its native ads platform. Polyvore has more than 350 advertisers who are retailers, Yahoo said. Native ads aim to grab more attention by taking on the appearance of editorial content or user posts. It's the latest in a string of acquisitions for the Yahoo CEO. Mayer is known around Silicon Valley to have a penchant for high fashion, ever since Vogue ran an article about her in 2009, and a photo spread a few years later. Yahoo has been struggling to grow its advertising business, but the company reported sales gains in its most recent quarter due to outside search partnerships. Polyvore's website and apps will continue to operate under Yahoo, the companies said on Friday. Terms of the deal weren't disclosed. Polyvore's origins are actually in Yahoo -- three former Yahoo engineers launched the site in 2007. Its team will now join Yahoo at its offices in Sunnyvale and San Francisco in California, and in New York.